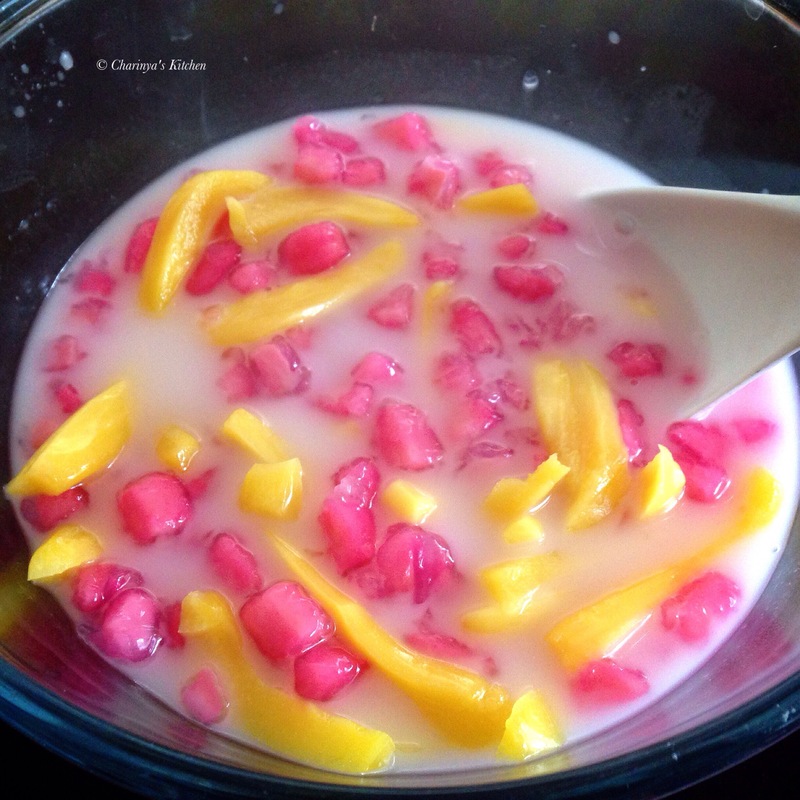 Tub Tim Grob, ทับทิมกรอบ is water chestnut coated with tapioca flour along with sliced jackfruit in sweet coconut milk. 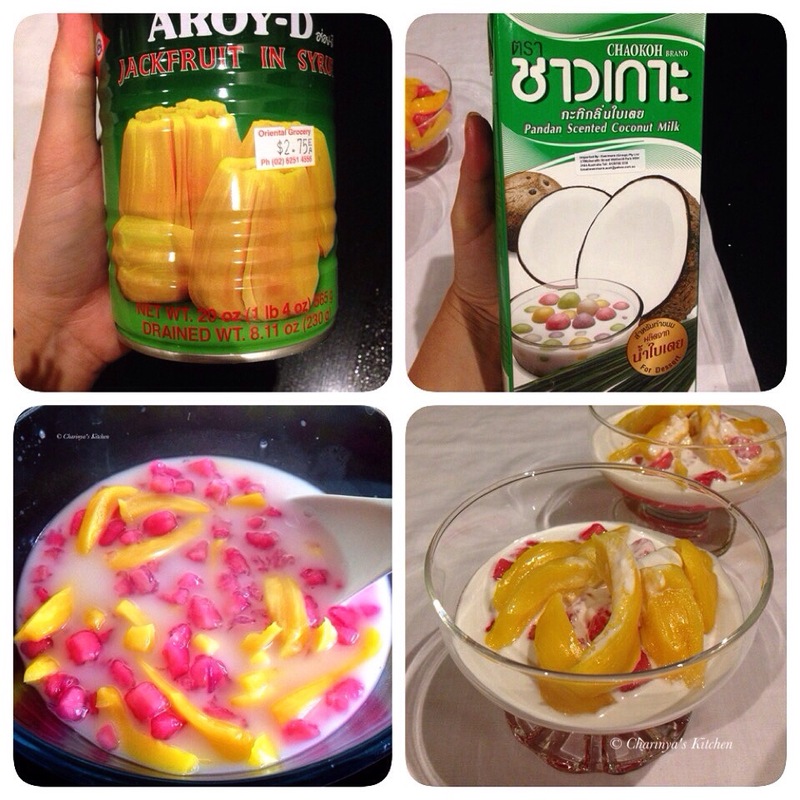 A Thai dessert that is very popular in Summer and is usually topped with shaved ice before serving. It is very easy to make and requires few ingredients. The recipe today could serve 6-8 people. Let’s have a look at the ingredients. • 1/2 cup Hale’s blue boy red syrup or substitute with a red food colour. 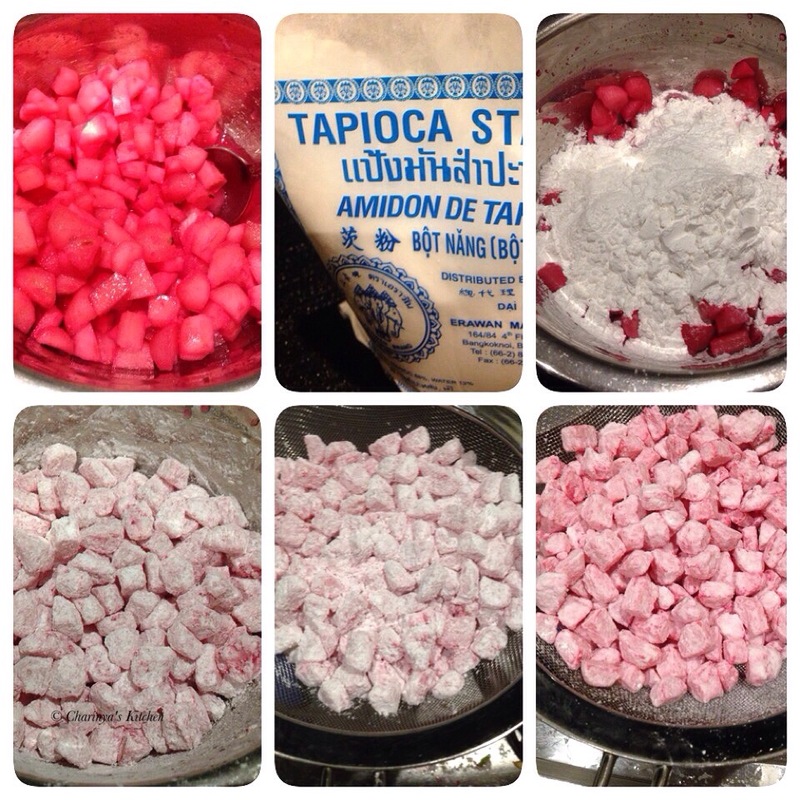 • 1 cup of tapioca flour. • Shaved or crushed ice to serve. 1. Drain the can of water chestnuts and dice them around 1cm square. 2. 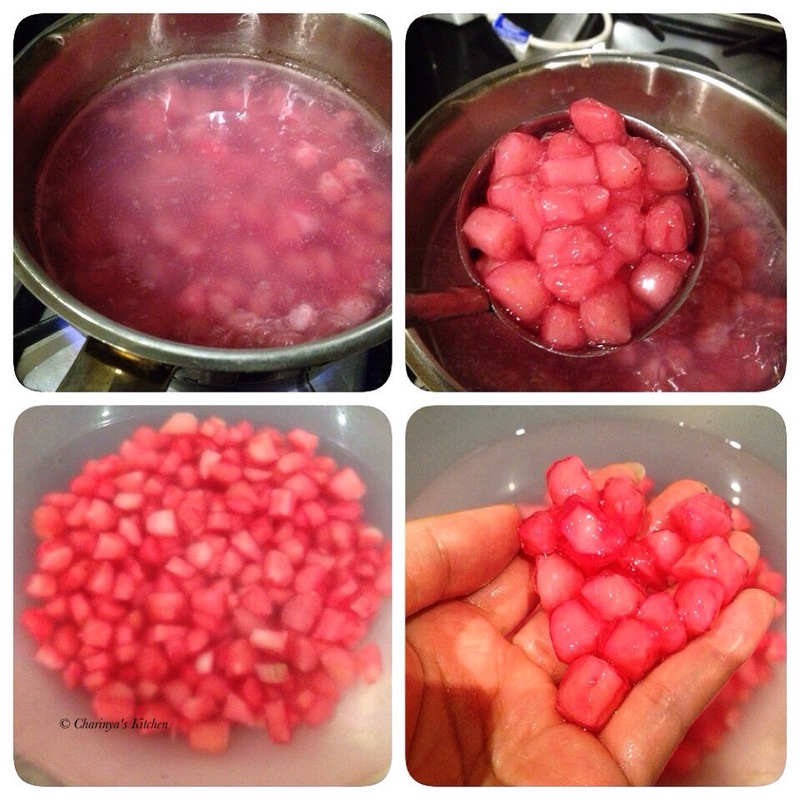 Soak diced water chestnuts in red syrup for 1 hr then drain the syrup. 3. Place the water chestnuts on a plate then pour over the tapioca flour. Make sure the flour coats all the water chestnuts. 4. Transfer the water chestnuts in the sifter then shake to get rid of the excess flour. 5. Boil the water in a pot and add the water chestnuts. It’s ready when the flour is translucent. Transfer to the cold water and it is ready to use. Add coconut milk in a saucepan then add sugar. Gently warm up short of boiling until the sugar dissolves and the coconut syrup is ready to use. 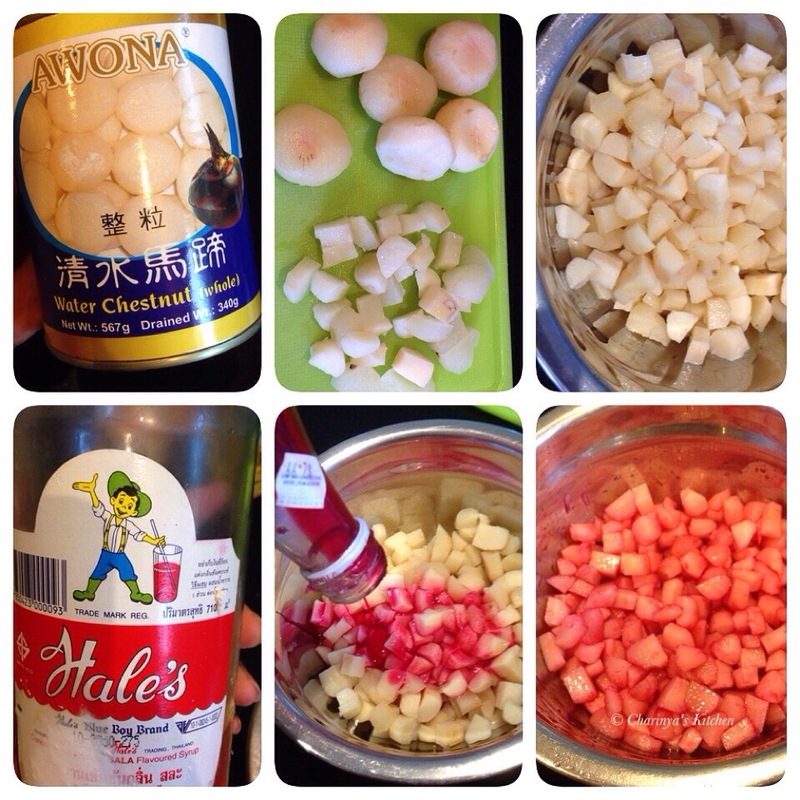 Add the red water chestnuts in a glass followed by shredded jackfruit then coconut syrup and top with crushed ice. Optionally you can add more items such as young coconut meat, red bean etc.